This week in Rhubarb and Sam, astronomy! We set-up at the Tucker Creek observatory for some time at the telescope only to have a clear night turn into a not-so-clear night due to high humidity. The stars were still pretty bright in our dark skies so we settled in on the moon couch (our disc shaped outdoor couch) to record an episode. 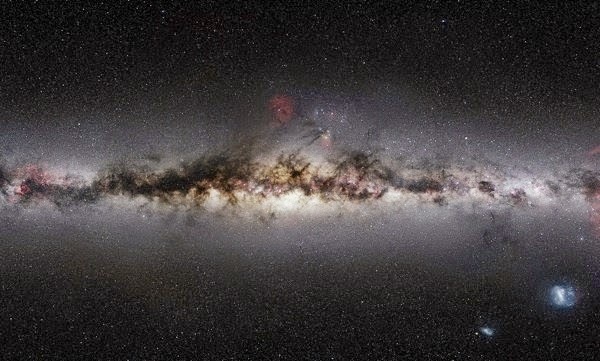 From Cygnus to Sagittarius, Saturn to Mars, take a tour of our night sky with us. There’s nothing quite like pondering our place in our galaxy and our galaxy’s place in the Universe. Have a listen! At the iTunes store via this link. 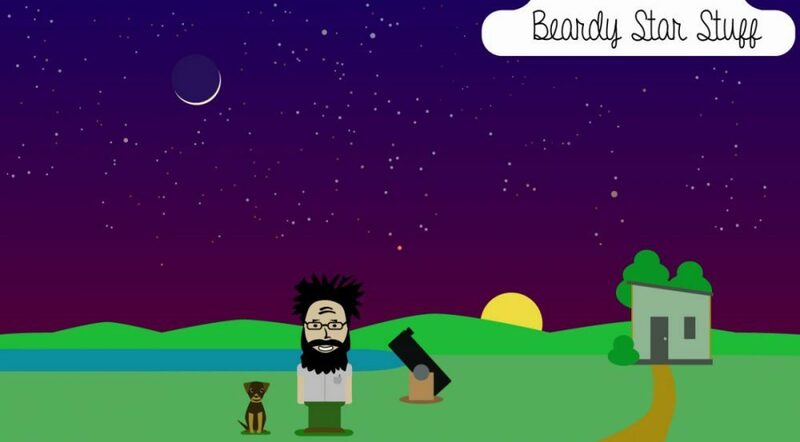 This entry was posted in Astronomy, Make-It-Do, Podcast on July 31, 2014 by Denny. There are moments in life when everything feels just right. I’m not sure if those moments are happening all the time and it is just a matter of seeing them, recognizing them and acknowledging them or if it is the act of recognizing the potential of their existence that we help them into existence. Whatever the case may be, I feel fortunate to have chosen a life, created a life, in which such moments seem to come often. If I had to guess I suppose I’d say that such moments become more numerous the more we are able to slow down, the more we are able to be in the moment with those around us. We had such a night tonight here at Make-It-Do. Dinner was unusual in that I missed it. We always make it a point to sit together for every meal. All of us. But tonight I slept through it because I’d been up late at the scope and because we had a long day in the car which left my back aching. I napped until Kaleesha woke me after six. By that time the kids had gone off to play in the woods. Kaleesha had made the two of us salads for dinner so we sat on the back porch to eat. The sounds of life went on all around us. The chickens and goats were doing their thing and off beyond the goat yard the kids were at the edge of the woods playing. So many sweet sensations all mixing together: the wonderful food, the cool and unusual July temperature, the sounds of children and farm and conversation between the two of us made for a wonderful start to the evening. Shortly after dinner we were separated for a bit as she took a call from her mom and as she often does while chatting on the phone, wandered around the house taking care of little chores. She took care of the bread dough she’d started before dinner and, not long after, she put the rising loaves into the oven the smell of fresh bread filed the house. The kids continued to play in the woods so I picked up my book on the Herschel Objects and started reading, alternating between the book and a few articles on the iPad. At some point I got up for a bit of coffee and decided to hang LED string lights on the back porch. It’s something we’d talked about doing just the other day in preparation for company coming Thursday night, so I thought I’d go ahead and get them up. By the time I’d finished the task the sun had settled in behind the trees and the kids had returned from their time in the woods. There’s nothing quite as sweet as these kids telling the stories of such evenings. They described the work they’d done in cleaning a little patch of woods they sometimes play in and showed me the fresh callouses on their hands. They were excited and very pleased with themselves. The bread was out of the oven and I was having another mug of coffee when we’d decided it was dark enough to get everyone ready to walk up the hill to the observatory. We’ve not taken much time to get everyone up here for viewing since we built the observatory. Mostly that is due to the seemingly never ending streak of cloudy weather which has meant observing time has been scarce. In recent days a couple of the kids have expressed a desire for scope time, so we jumped at the chance to share a clear night with them. As an amateur astronomer one of the greatest joys is sharing the beauty of the Universe. There’s nothing quite like the reactions one hears when someone sets their eyes upon Saturn or the great globular cluster of Hercules or any number of other beautiful objects. Sharing it with kids is even better. By the time we’d gotten the scope out it was just starting to get dark and Saturn was low in the horizon so I started with the beautiful ringed planet. Justin had the first turn and he seemed more interested than he’s ever been. Most people, kids included, usually don’t keep their eyes at the eyepiece long enough. I’ve noticed the same thing whenever I’ve taken a walk in the woods with others. More often than not, such walks seems to be a race to finish the walk with little time taken to really observe the details of everything on or near the trail. I suppose I’m not surprised. Our culture seems to emphasize quantity over quality, passive consumption over authentic engagement. 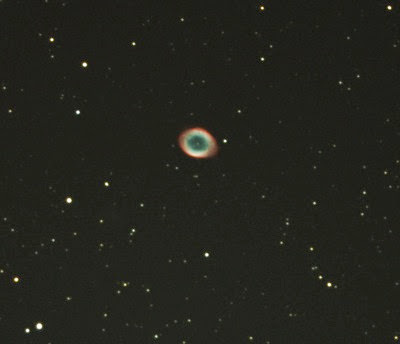 This is a mistake, especially when it comes to amateur astronomy. Objects in the night sky are much better when viewed for a length of time. Our eyes take time to adjust to the dark and even after they are dark adapted more time looking through an eyepiece almost always allows for our brains to notice fine details. Justin took his time. In fact, he seemed to be in no hurry at all as he focused on the planet. The scope moves easily and he has a tendency to bump in when he leans in, so I got on the ground while Kaleesha helped him at the eyepiece. From the ground I could look up the tube to the center red circle and keep the planet where it needed to be. Every 20 seconds or so we repeated the question to make sure he still had it in his view and each time he responded with “Yep.” He looked far longer than any of the other children; probably 2 minutes, maybe more. He was very attentive. Finally he pronounced, “Royal’s turn!” and moved away from the scope. The kids all cycled through their turns at the scope, most of them offering some sort of excited acknowledgment of what they were looking at. From there we moved on to Mars which was just off to the west of Saturn. Royal requested that we look at the beautiful blue and gold double star Alberio in Cygnus. He remembered it from our very first time at the telescope in November 2012, so we moved to that next. From there we moved to the Ring Nebula and last the M13, the Great Globular Cluster in Hercules. our 12″ telescope. Our view has less color. 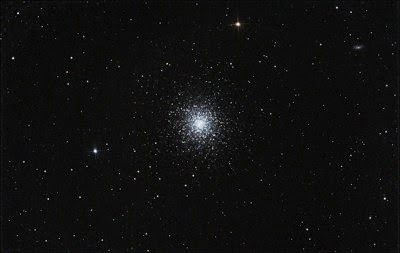 Messier 13 contains several hundred thousand stars; some sources even quote more than a million. The brightest is the variable star V11, with an apparent magnitude of 11.95. Toward the center of M 13, stars are about 500 times more concentrated than in the solar neighborhood. While the probability of collisions between stars in such a crowded region is negligible, the night sky seen from a planet near the center of of this globular cluster would be filled with thousands of stars brighter than Venus and Sirius! Unlike open clusters, such as the Pleiades, globular clusters are tightly bound together by gravity, and contain very old, mostly red stars. The age of M 13 has revised to 12 billion years – nearly as old as the Milky Way galaxy itself. Born before the Galaxy’s stars had a chance to create metals and distribute them them in its star-forming regions, M 13’s iron content relative to hydrogen is just 5% of the Sun’s. M13 as it appears in our 12″ telescope. It is a sight to behold. As the kids took their turns at the eyepiece on this last object I explained what they were seeing just as I had for the other objects. Justin, upon looking at the cluster simply said, “It’s a galaxy!” We corrected him, knowing that while he may not understand the difference some of the other kids, Little Brook, Royal and Blue would likely pick up on it and would likely have a better understanding of the difference. There’s something extraordinary about taking our time to explore the Universe with one another, especially when children are involved. Whether it is a globular cluster or a tiny frog, they are intensely curious. I continue to be amazed by the details they pick up on and the amount of information that they retain. While the youngest may not fully understand the difference between a galaxy and a globular cluster they certainly retain the information that they are different. Just as exciting as our shared explorations is that they are actively investigating on their own time. The other day Little Brook saw a photo of a nebula as the kids were browsing through one of our astronomy photo books and excitedly proclaimed “That’s the Horsehead Nebula!” This was something that she had learned on her own. Imagine a five year old learning to identify the Horsehead Nebula! Sometimes all I can do is shake my head and smile. As I sit typing this there are 3 day old ducklings happily chirping as they follow their momma just 10 feet outside my window. One room away Farra is working on some chain-mail armor and Blue and Little are speaking in very well done British accents as they play on the porch. Yeah, I live in Wonderland. 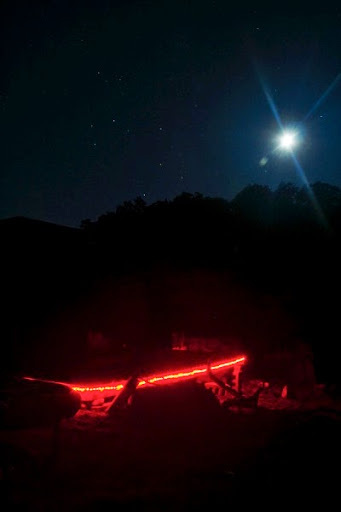 This entry was posted in Astronomy, Living Simply, Make-It-Do, Observatory on July 30, 2014 by Denny. This week in Rhubarb and Sam a middle of the night discussion of identity, life on earth, feeling small and feeling large. Have a listen! This entry was posted in Make-It-Do, Podcast on July 15, 2014 by Denny.